Due to graduations and trades, the Yankees no longer boast one of the top farm systems in baseball. They have one of the top Major League rosters instead. I’d take that over a top farm system any day of the week. The Yankees currently have a pitching heavy system with quite a few high-end teenagers who are years away from the big leagues. That equals risk. It’s a boom-or-bust system, for sure. 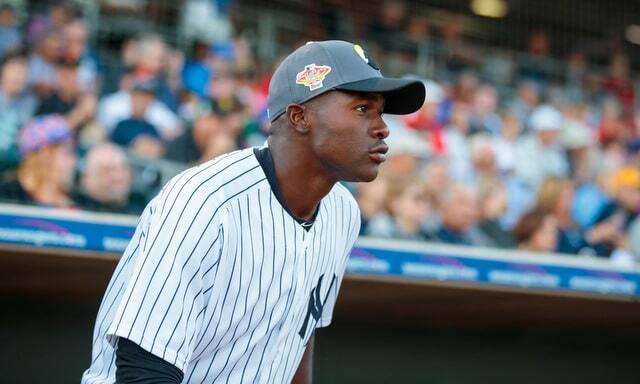 Although the farm system no longer offers potential impact talent close to the big leagues, the Yankees do still have a fairly deep system, so much so that several quality prospects did not make my annual Top 30 Prospects List. That’ll be posted tomorrow. First we have to get to my Not Top 30 Prospects. These are players on the outside of this year’s top 30 who could jump into next year’s top 30. One of last year’s not top 30 prospects made this year’s top 30. Two others were among the final cuts, and another was traded away, though he wouldn’t have made the top 30 anyway. I’ve done this long enough to know two not top 30 prospects becoming top 30 prospects is a good success rate. One? Eh, close enough. I’ll try better next year. Prospect ranking is little more than informed guesswork. Just to be clear, these are not prospects 31-35. They are simply five prospects on the outside of this year’s top 30 list who I think could make next year’s top 30 with a good statistical season and positive development in 2019. Here are this year’s five not top 30 prospects, listed alphabetically. The Yankees landed Duran almost by accident. He was a projected mid-six-figure bonus prospect for the 2016-17 international signing period but neglected to register with MLB, so he was unable to sign. Duran became a forgotten man, so by time he actually registered to sign, he was already 18 and teams had earmarked most of their bonus pool money for other players. The Yankees swooped in with a $10,000 bonus and here we are. Duran made a name for himself in the Dominican Summer League in 2017 and again in minor league Spring Training last year, though he fell flat with Rookie Pulaski last summer. Pitchers took advantage of his aggressiveness at the plate and gave him fits all season. Duran’s tools are unchanged, however. He has premium bat speed and puts up big exit velocities from the right side, and he doesn’t miss pitches out over the plate. For a little guy (5-foot-11 and 185 lbs. ), there is a lot of thump in Duran’s bat, even if he didn’t show it last year. The downside here is Duran’s thick lower half and defensive tools that point to a future in a corner outfield spot rather than second base. Also, there’s little room for projection. Even at 19, Duran is close to maxed out physically, so what you see is probably what you’ll get long-term. Can Duran clean up his plate discipline? If yes, he could force his way up the ladder. If not, more seasons like 2018 are coming.
? Seven-figure signings like Antonio Cabello, Everson Pereira, Ronny Rojas, and Raimfer Salinas headline the Yankees’ 2017-18 international signing class. It is Garcia and several other smaller bonus prospects who could turn this into a banner haul. Garcia has drawn comparisons to Brewers-turned-Mariners outfielder Domingo Santana for his size (6-foot-5 and 204 lbs.) and power, though Garcia has a long way to go to get to where Santana is now. Garcia led the Gulf Coast League in home runs last year and he has near 80 power on the 20-80 scouting scale from both sides of the plate, though he’s more refined as a left-handed hitter, which is good because that’s the heavy side of the platoon. That 40.6% strikeout rate stems from a tendency to swing-and-miss at pitches in the zone rather than a lack of discipline. Garcia knows a ball from a strike. He just misses those strikes too often. In the field, Garcia runs quite well given his size and he has a good arm. Chances are he’ll slow down as he gets older and settle in as an average-ish defender. Garcia has exciting upside like Santana. The downside with Santana is that, when he isn’t hitting for power (like 2018), he’s kinda useless. Garcia is a switch-hitter and has a chance to be a better defender. Clearly though, the power is his calling card. When the Yankees signed Gomez he was tall and scrawny with good athleticism and a quick arm. Everything pointed to him adding velocity and firming up his stuff as matured and that is exactly what happened. Gomez, who is now listed at 6-foot-3 and 175 lbs., sits in the low-to-mid-90s with his fastball, and pairs it with a snappy upper-70s curveball that misses bats. His changeup shows promise as well. The physical tools are good, but what really makes Gomez stand out is his creativity and craftiness. He knows how to make his fastball cut and sink, and he likes to steal strikes in hitter’s counts with a curveball in the zone. Gomez is a smart pitcher who maybe gets a little too cute at times, though that’s something he’ll grow out of in time. The biggest knock against him is his shaky command, mostly with his secondary stuff. The Yankees have a knack for digging up quality small bonus pitching prospects on the international market and Gomez is next in line. Peraza is a tools guy who is still working to turn those tools into baseball skills. He’s listed at 6-foot-0 and 176 lbs., and he currently does his best work in the field, where he is a no-doubt long-term shortstop. Peraza has good range, good hands, and good athleticism, and his feel for the position is very advanced. He positions himself well, makes good decisions, and has a good internal clock. Offensively, Peraza has little power and he’s still learning to recognize spin and control the strike zone. He’s a righty hitter with good bat-to-ball skills, and he adds value on the bases through his speed and baserunning instincts. The Yankees have had some success with this profile. Guys like Abi Avelino and Thairo Estrada have similar skill sets and became MLB options (and a trade chip, in Avelino’s case). Peraza is still very young and I’m probably Not Top 30-ing him a year early, but I’ll take my chances.
? Yajure had a promising but short-lived stint in the Rookie Gulf Coast League in 2016. He threw 31.1 innings, then blew out his elbow and needed Tommy John surgery. Yajure returned last year with a fastball that jumped from the low-90s into the mid-90s, and when that happens, it’s usually because the Tommy John surgery rehab is more intense than anything the player did previously, not because the new ligament gave him superpowers. A quality curveball and a quality changeup complement Yajure’s new and improved fastball, and even though pitchers tend to struggle with their control when they first return from elbow reconstruction, Yajure did not. He locates everything well, especially his secondary pitches for his age. He’s not especially big (6-foot-1 and 175 lbs.) and once the elbow gives out once, long-term durability questions will inevitably follow. Such is the life of the pitching prospect. While Yajure’s stuff is quite good, his career strikeout rate (18.0%) and last year’s swing-and-miss rate (11.1%) do not stand out. He hasn’t missed as many bats as the raw stuff would lead you to believe. That said, he’s 20 years old and he’s thrown 64.2 innings with his new elbow ligament. Let’s see what happens when he gets further away some surgery. Yajure figures to return to Low-A Charleston for a few weeks this year before moving up to High-A Tampa. The holidays have arrived and hot stove news has come to a crawl, so here are some miscellaneous — but not insignificant — links and bits of news to check out. Last week MLB and the MLBPA announced an agreement with the Cuban Baseball Federation that “will provide Cuban baseball players with a safe and legal path to sign with a Major League Club.” Here’s the press release. Many players, including Yasiel Puig and Jose Abreu, defected from Cuba by being smuggled off the island by criminals, and were later threatened and shaken down for money. This new agreement helps prevent that. Under the MLB-CBF agreement, players who are at least 25 years old and have played six years in Cuba must be made available to MLB teams. CBF clubs can also choose to make younger players available. When a player signs with an MLB team, the MLB team must pay his former club in Cuba a release fee that follows the same formula as Japanese players (explained here). This is, truly, great and historic news for baseball. There is now a safe and proper channel for bringing Cuban talent to MLB. This is potentially huge. According to Josh Kosman, MLB “favors a plan” in which in-market streaming rights would be transferred from the league to individual teams. The Yankees and several other teams have been pushing hard for this for years. This means that, if you live in the Yankees’ home market, you would no longer have to be a cable subscriber to watch the YES Network. You could cut the cord and subscribe to the team’s streaming service instead. The catch here is that when MLB transfers in-market streaming rights to teams — “when” is more appropriate than “if” here because this does feel inevitable, if not now then down the road — the teams will probably turn around and sell those streaming rights to the highest bidder (Amazon, Google, Netflix, etc.). Amazon is reportedly making a big push to secure regional sports streaming rights and I’m sure they’d love to get their hands on the Yankees. So, rather than buy an in-market streaming subscription straight from the Yankees or MLB, you’d have to sign up for Amazon’s video service. We’ll see. None of this has happened yet but things are heading in this direction.
? I missed this a few weeks ago. Baseball America (subs. req’d) wrapped up their annual look at the top 20 prospects in each minor league with the rookie Gulf Coast League. Three Yankees made the list: OF Antonio Cabello (No. 7), OF Anthony Garcia (No. 12), and RHP Yoendrys Gomez (No. 14). Baseball America posted Cabello’s full scouting report on Twitter, so check that out. He ranked one spot ahead of Orioles RHP Grayson Rodriguez, the 11th overall pick in the 2018 draft, on the GCL list. Gomez ran his fastball up to 96 mph this season in the GCL, parking in the low-to-mid-90s. He throws with downhill angle and locates his fastball well to both sides of the plate for his age. Gomez had 10 strikeouts per nine innings in the GCL thanks in part to a tight, sharp curveball in the mid-to-upper 70s with good depth that flashes above-average to freeze hitters or gets them to chase. He showed feel for a mid-80s changeup that he’s willing to throw to both lefties and righties. The Yankees signed the 18-year-old Gomez for a mere $50,000 two years ago and now he’s showing three pitches with good velocity and a potential swing-and-miss curveball. The Yankees seem to turn two or three of these small bonus kids into legitimate prospects each year. Domingo Acevedo ($7,500), Freicer Perez ($10,000) and Jonathan Loaisiga (not sure he even got a bonus) all fit in this group. With the college and high school seasons only a few weeks away, MLB.com released their first top 50 draft prospects list for 2019. Oregon State C Adley Rutschman is the consensus No. 1 player in the draft class and he’s probably the most locked in No. 1 pick this far out from the draft since Gerrit Cole in 2011. That doesn’t mean Rutschman is a lock to go first overall to the Orioles. It just means he’s the most clear cut No. 1 guy in quite some time. Why It Makes Sense: Baty will get talked about for both his prodigious strength in the lefthanded batter’s box and also the that he will be 19 and a half years old on draft day. This might not bother the Yankees as much as other teams, as New York just took high school catcher Anthony Seigler in the first round last year, who was also old for his class. One, “Brett Baty” is an outstanding baseball name. And two, a 19-and-a-half-year-old high schooler in the first round? I can’t imagine that’s happened often. And geez, Seigler didn’t turn 19 until after the draft last year. He wasn’t that old for his class. Anyway, at this point in the draft season (i.e. it hasn’t started yet), any mock draft is almost certainly speculation more than hard “this team is on that guy” reporting. Lots can and will change between now and the draft. The 2017-18 international signing period opened this past Sunday, on July 2nd as always, and for the first time in three years, the Yankees are not hamstrung by the penalties associated with their 2014-15 signing period spending spree. They were limited to a $300,000 bonus maximum the last two signing periods, which took them out of play for the top international prospects. Although they are no longer held back by individual bonus limits, the Yankees are now dealing with the international free agency hard cap. Every team is. MLB and the MLBPA agreed to a hard spending cap as part of the latest Collective Bargaining Agreement. The Yankees have $4.75M to spend during the 2017-18 signing period. Some teams have $5.25M and others have $5.75M. It depends on market size and things like that. The Yankees did, however, acquire more international spending money over the weekend. 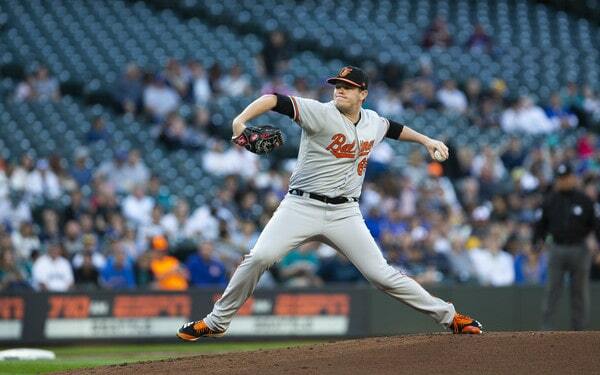 They shipped minor league righty Matt Wotherspoon to the Orioles for an undisclosed amount of bonus money. Teams can only acquire 50% of their original cap, so all we know is the Yankees did not receive more than $2.375M from the O’s. Chances are they acquired a smaller sum. Now that they can once again be major players internationally — at least as much as their bonus pool allows — the Yankees dove in and signed several prospects since the open the signing period Sunday. More signings will trickle in over the next few weeks and months, though just about all of the top prospects sign on July 2nd. 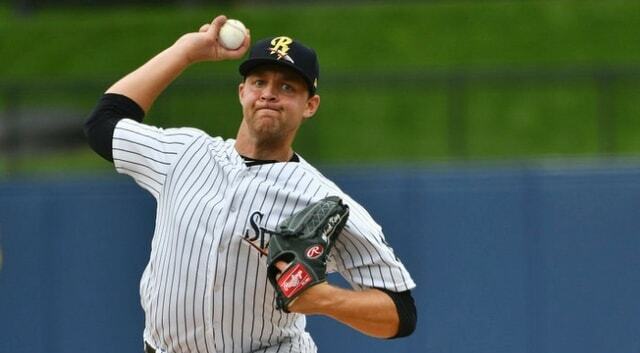 Here’s a recap of the Yankees’ latest international haul. If Pereira’s name sounds familiar, it’s because the Yankees have been linked to him for some time now. We first heard about him back in February. Most of these international prospects agree to terms months in advance — sometimes even years in advance — even though those agreements are technically against the rules. MLB doesn’t enforce them though. Scouts love this teenager from Venezuela. Pereira is a true center fielder, and if all goes according to plan, that’s the position he will play in the big leagues one day. He’s considered a plus defender and a plus runner … He has also shown good instincts and a good feel for the game on both sides of the ball. On offense, Pereira has displayed a good line-drive swing and has a chance to hit for average with some power in the future. The Baseball America (subs. 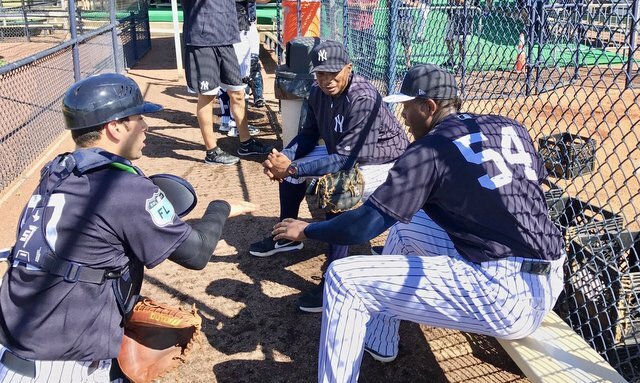 req’d) scouting report says Pereira has “one of the most balanced, well-rounded skill sets in the 2017 class, with a promising combination of tools and game awareness.” Once upon a time the Yankees were all about loud tools, and they still are, for sure. But it seems lately they’ve been emphasizing baseball instincts and things like that. Rojas is a shortstop from the Dominican Republic, and while he has not signed with the Yankees, Ben Badler says he expects it to happen. Why hasn’t Rojas signed yet? Because he’s still only 15. He has to wait until his 16th birthday on August 23rd to sign his first pro contract. The Yankees have been connected to Rojas for a while and it’s believed the two sides already have an agreement in place. They’re just waiting for his 16th birthday. Rojas succeeds in large part because of his quick hands and a good hitting approach from both sides of the plate. Scouts think he has a chance to hit for average and they love that he makes hard contact from both sides. In games, Rojas has displayed gap-to-gap power and there’s a chance he could hit home runs in the future … He makes all of the routine plays and has enough arm strength to keep him at the position now and in the future. Both the MLB.com and Baseball America scouting reports tout Rojas as one of the best bats available this signing period. A switch-hitter with good offensive potential from both sides of the plate and a chance to stay on the middle infield? Sign me up. A converted outfielder, Chirinos has all of the tools to stay at shortstop, specifically, a plus arm and good actions on defense. He makes all of the routine plays and has a feel for playing in the middle of the infield despite less than two years at the position. He has also impressed scouts with his quick hands and makeup … At the plate, Chirinos makes hard contact to all fields and has shown good bat speed. Interestingly enough, both the MLB.com and Baseball America scouting reports identify Chirinos as a candidate to convert to catcher given his tools and baseball aptitude. He’s also a very high-end energy guy. The Yankees have had a lot of success converting infielders into catchers — Jorge Posada, Francisco Cervelli, and John Ryan Murphy are all converted infielders, and Donny Sands is attempting to make the transition now — and I bet they try it again with Chirinos. None of those seven players ranked among the top international free agents by MLB.com, Baseball America, or FanGraphs. The fact Rosario, Marte, and Vega received six-figure bonuses tells us the Yankees like them though. They don’t give nobodies six figures. Venezuelan OF Raimfer Salinas (6th by MLB.com, 10th by BA): “(There’s) a belief the young outfielder has the potential to be a legitimate five-tool player and an impact player in the near future,” says the MLB.com scouting report. Venezuelan C Antonio Cabello (8th by MLB.com, 15th by BA): “(He) hits in games and his makeup is considered off of the charts. He has built a reputation as a tough and hard-nosed competitor who hates to lose,” says the MLB.com write-up. Venezuelan SS Osleivis Basabe (NR by MLB.com, 46th by BA): “On pure athleticism, Basabe is one of the best in the class … Basabe is a great athlete with good bat speed but his hitting remains a project,” says the Baseball America scouting report. Between Pereira, Chirinos, Garcia, Rosario, Marte, and Vega the Yankees have already spent $3.45M of their $4.75M hard cap space. There are surely other signings we haven’t heard about yet, so they may have less than $1M of their original hard cap space remaining. That doesn’t even include the presumed Rojas deal, which will likely be worth close to $1M if not more. That said, the Yankees did make the trade with the Orioles, and they did that for a reason. They need the bonus space to sign players. They made that trade because they have deals lined up, not because they merely hope to work something out. Maybe they’re going to sign Salinas, or Cabello, or Basabe, or all three, or different players entirely. That money is going to somewhere though. We’ll find out soon. So what’s the deal with Otani? Given everything that happened on July 2nd around the league, I can’t imagine Nippon Ham Fighters ace/slugger Shohei Otani is coming over to MLB this offseason. Every team used up their hard cap space, including potential Otani suitors like the Yankees, Red Sox, Mets, Mariners, Rangers, Phillies, and Angels. Other clubs like the Dodgers, Cubs, Nationals, Astros, Cardinals, Braves, Padres, and Giants are limited to $300,000 bonuses this signing period due to past international spending. No team has significant bonus pool space remaining. They spent it all on international amateurs once the signing period opened Sunday. Either Otani is going to take a low six-figure bonus (nope) or he’s not coming over this winter (yup). He could wait two years until his 25th birthday, at which point he could sign a contract of any size. MLB and the MLBPA really screwed this up. They should be trying to attract players like Otani, not push them away.